The Chicago Cubs are right in the thick of the National League Central race, but they’re also dealing with a slew of injuries as the All-Star break approaches. 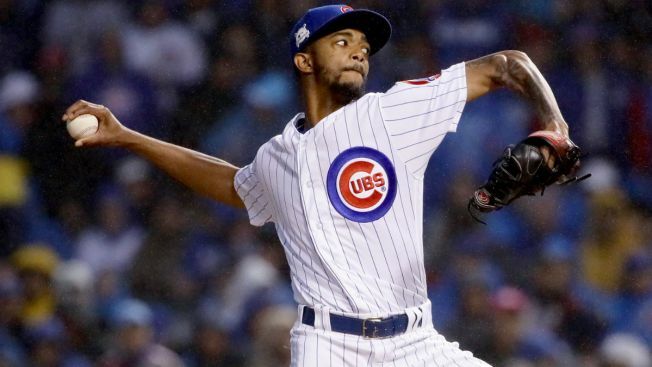 The team did get some good news on a couple of players Friday, including Carl Edwards Jr. The reliever, who has been on the disabled list since May 30 with right shoulder inflammation, will make a rehab appearance on Friday night as he continues to work back from the injury, and if he’s able to come back soon, it would help a bullpen that has been taxed heavily due to short starts and injuries. The Cubs will also get another look at Kris Bryant on Friday, as he will take swings off a tee and will take ground balls at Wrigley Field. Bryant was placed on the disabled list with a shoulder issue, and is hoping to get healthy after a month that saw him hit just one home run. Unfortunately, not all of the Cubs’ injury news was good, as pitcher Yu Darvish will head to Texas to get a second opinion on his triceps tendinitis. The injury has kept Darvish out of the rotation since late May, and he suffered a setback Thursday in Los Angeles when he felt pain in his arm during a bullpen session. The Cubs will take on the Minnesota Twins at 4:05 p.m. Friday afternoon.